We're friends with a family who lives in Hull and one of the parents is a native English speaker, the other a native French speaker. They decided to only speak French at home as their children were exposed to English regularly at daycare. Before the kids even started school they were fluently bilingual. After a recent family trip of our own to Quebec I was impressed with how many French words my own kids picked up on and remembered - it's clear kids have an interest in, and a natural affinity for, learning new languages. 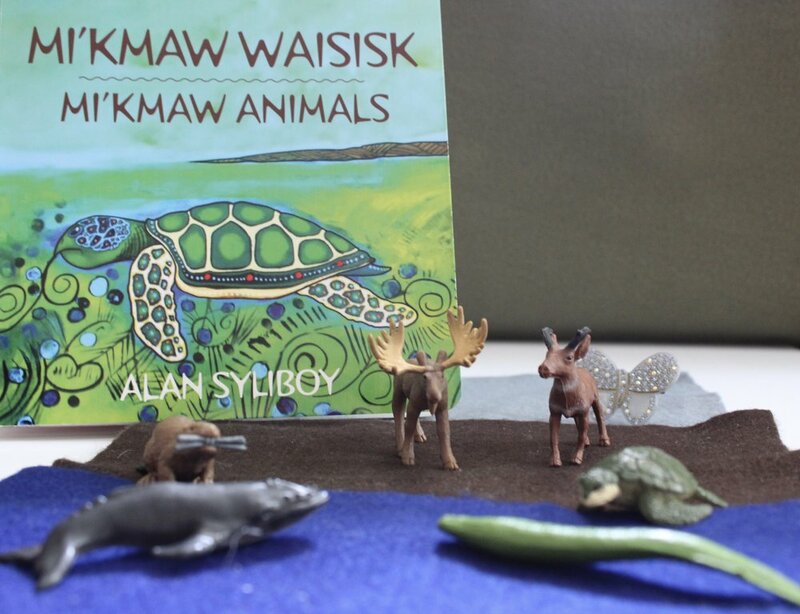 This month's book club book is called Mi'kmaw Waisisk/Mi'kmaw Animals by Alan Syliboy (published by Nimbus Publishing) and it is a board book for babies and toddlers but my preschool and school age kid both loved learning the Mi'kmaw words in it. 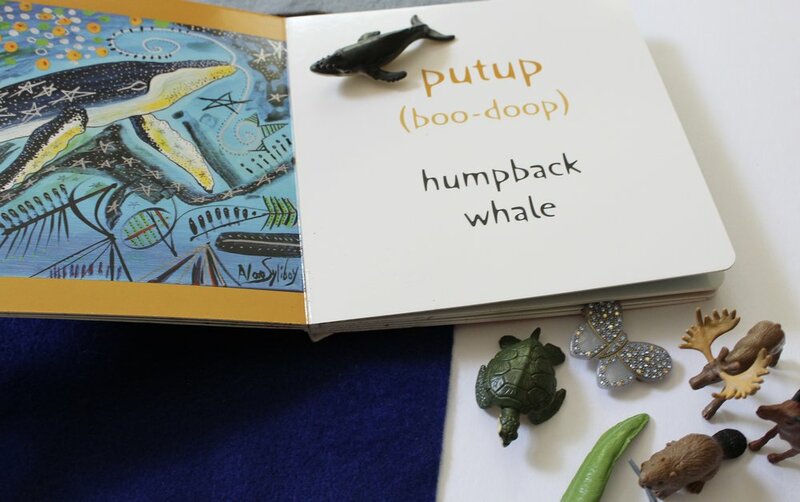 It has beautifully drawn images that will delight readers of all ages, along with the English and Mi'kmaw word for each animal, as well as the proper pronunciation of the Mi'kmaw word. This book inspired our book club activity this month to teach babies, toddlers, and preschoolers about animal habitats, and learn a bit of a second language while they're at it! Read this book with your child and practice saying the words in English and Mi'kmaw. Talk about each animal - where it lives, what it might eat, it's colour, body type (shell, fur, scales, feathers, wings, etc.). Begin by creating three sections to represent the land, water, and air habitat. We were headed out on vacation while working on this so we decided to create this portable felt play station to represent each habitat. Used on a tray it's a perfect "to-go" car ride activity! Some other ideas to represent habitats are play doh, paint a scene on an old piece of wood, use three bins (one with water, one with dirt, and one with nothing/air in each or even set something up with a bin of water and real dirt outside! Cut a square out of each colour of felt, approximately the same size. Don't worry about exact edges as they'll be overlapping and the real world doesn't have clean lines 🙂- a wobbly shore line looks more realistic. You can add trees or clouds too if you wish but my kids liked flipping it around to switch the water and sky from blue to grey so we kept it able to be used either way. Use the hot glue to attach the three pieces together with the sky on top, earth in the middle, water on the bottom. We had some plastic toy animals to represent each of the ones in the book (if it's not exact, as long as you have an animal similar to it, that will work). We got some of ours at the dollar store and thrift stores, and got some of the ocean and North American TOOB animals at Michael's with their handy 50% off coupon. Then hand over the play station and animals to your child and sit with them while they sort the animals into their correct habitat, talking about why each animal does or does not go in each habitat. Say the English or Mi'kmaw words as you go so they associate the names with the animals.